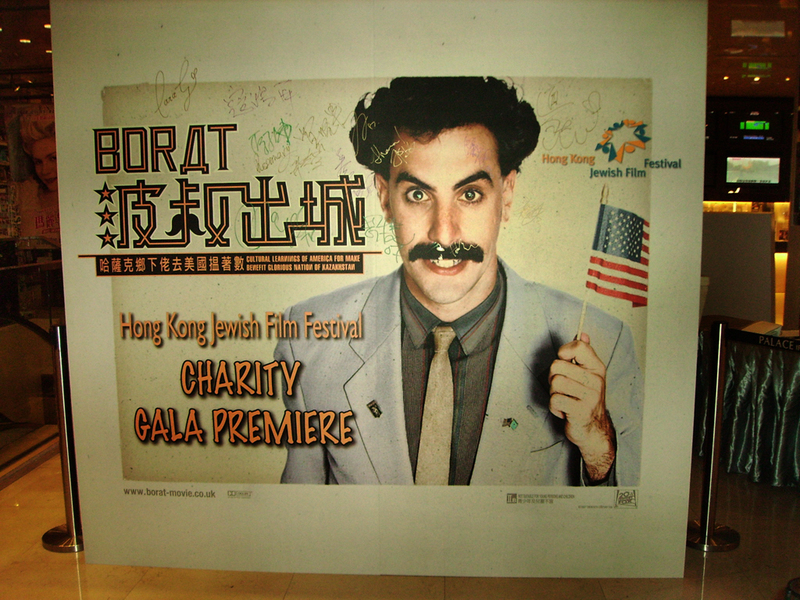 When the film, BORAT (or, more correctly, BORAT: CULTURAL LEARNINGS OF AMERICA FOR MAKE BENEFIT GLORIOUS NATION OF KAZAKHSTAN), came out at the end of 2006, I knew I wanted to have the Hong Kong premiere. I had only ever programmed a film without seeing it first once before, and I had promised myself that I wouldn’t take that kind of risk again. 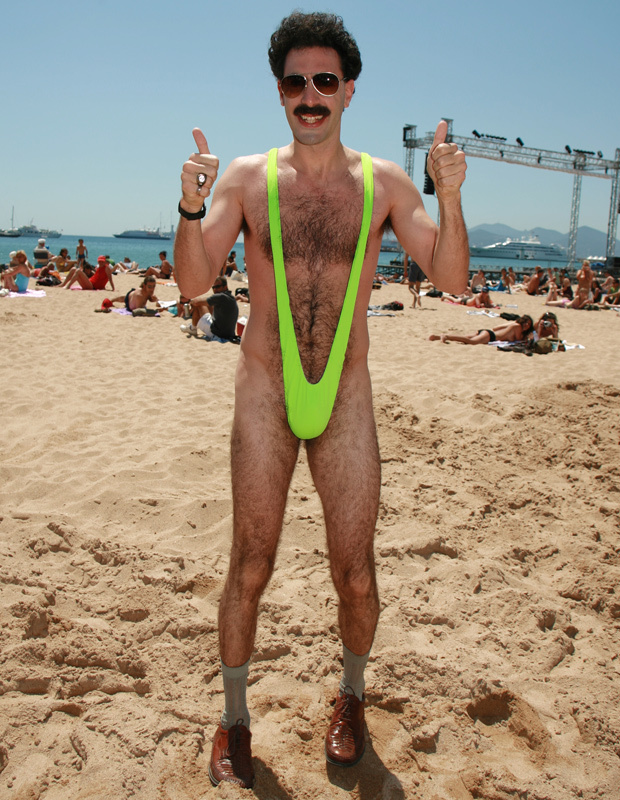 But the advance word on BORAT was that it would be a fairly safe bet to make. 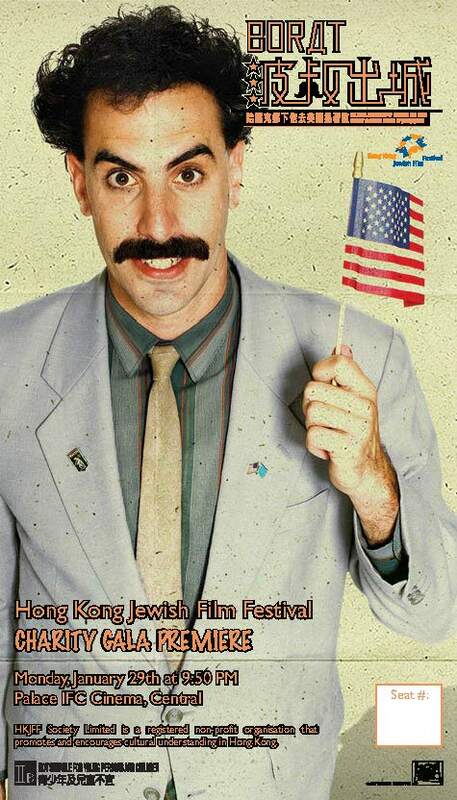 So I contacted the local distributor and asked if I could have the HK premiere as a fundraiser for the Hong Kong Jewish Film Festival. She thought I was crazy. She had seen the film and she told me that Borat was an anti-Semite. She didn’t use the word “anti-Semite” (she didn’t know the word in English) but she knew that Borat didn’t like Jews. I smiled and said that I knew. “That’s why I want to show it”, I told her. “The film is satirical.” (The concept of satire is mostly lost on the Chinese.) She shrugged and let me have it. Now that I had the film, I had to think about how I could really make the screening into a memorable event. I asked the distributor if 20th Century Fox (the film’s producer) had any branded promotional items for the film available. She checked her catalogue and, sure enough, they did — a beach ball, a green tote bag, a pin and the mankini, which the whole world (except in Kazakhstan) had already seen millions of times on YouTube. I said I would buy 100 of each. Next came the question of how to get the “swag” to the audience in an efficient yet surprising manner. I had watched the trailers from the film and I came up with the idea to put the items inside paper lunch bags. Finding such bags in HK is not such an easy task as no one “brown bags” it here but I did find them soon enough. Then I bought some brown raffia twine for closing the bags. 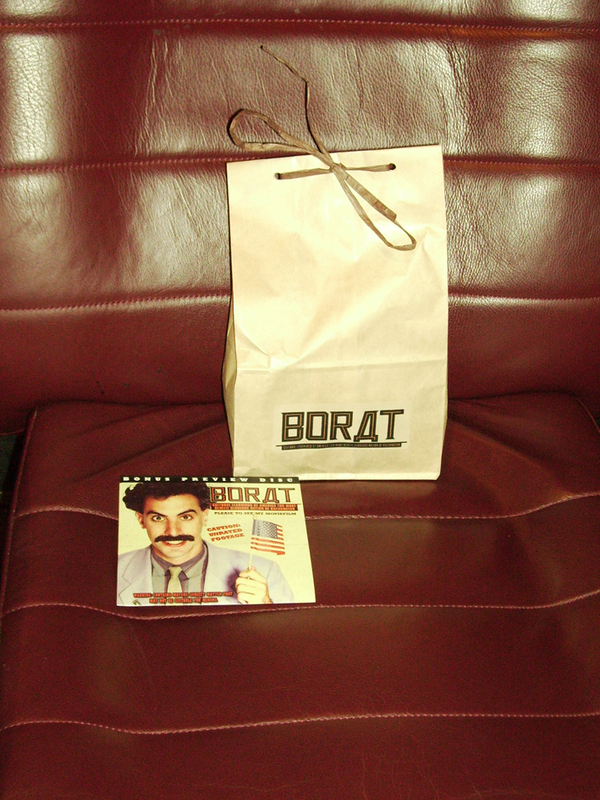 The distributor sent me the BORAT logo, which I printed on clear plastic address labels. I affixed those to the bags. Every bag contained either the beach ball and the tote bag or the pin and the mankini. (I assumed that the tote bags and the mankinis would be the most popular items.) I then placed the bags on alternating seats in the cinema, figuring that a couple would end up with one of every item. At the worst case, people would swap items, which they did! I produced a huge poster (8 x 7 feet), which the cinema let me install at their entrance. Everyone who came to see the film was invited to sign their name to the poster. I also produced souvenir movie tickets, which local people love to collect. I had promised everyone that the evening would be like nothing they had ever experienced before, and a rumour quickly went around the Sacha Baron Cohen was going to attend the screening. It was possible, as some people in the community had gone to school with him and our rabbi at the time had even officiated at his bar mitzvah. I enjoyed the attention the event was getting so I did nothing to set the record straight. But, in the end, I did deliver an event like no other. As people filed into the cinema and opened their brown bags, we could hear screams of delight as they realised what was inside. Men were modeling their mankinis over their business suits, which only led to more howls from the crowd. The big question going around the room was who would be “man” enough to wear their mankini without any clothing underneath! Since that night, whenever Hallowe’en or the Jewish holiday of Purim comes around, I wonder if anyone wears their mankini. So far, I haven’t seen anyone wear one in public but I have heard reports of a few couples having a good laugh about it in the privacy of their bedrooms! Howard For Film creates customised film events for consulates, corporations, institutions and individuals. The company is currently developing four events — a film retrospective in Hong Kong, a themed film festival in Beijing, a themed film series in Hong Kong, and a multinational film festival in Hong Kong.